The California Interscholastic Federation moved up all state competitions except for Cross Country one week ahead which is the reason that the California State Track and Field meet takes place this year on May 24/25. Despite the date change, the premier distance event in Northern California will remain on the same weekend, the 3rd week in March. 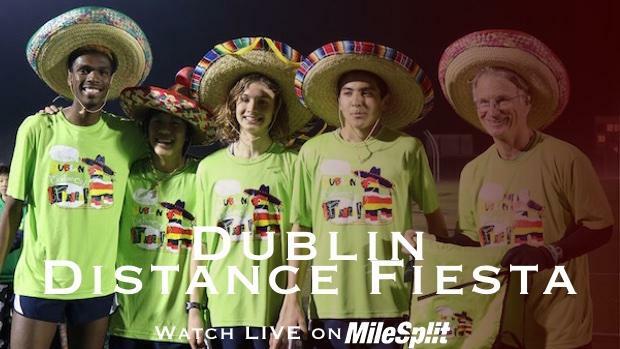 This Saturday, Dublin HS will once again host the Dublin Distance Fiesta which this year will field an incredible 118 teams and 2633 competitors! The previous bests were set last year at 101 teams and 2334 competitors. According to meet director Chris Williams, the DDF will be the largest distance only meet in the United States for the second year in a row based on the total number of entries. The meet has been held at Dublin HS for the 11th year and has evolved from its humble beginnings at Piedmont HS and stops along the way at Cal Berkeley and Skyline HS. You can see below the incredible efficiency of this meet thanks to Jesuit coach, Walt Lange. The meet is also officially linked to the top invitational in the country, the Arcadia Invitational. Along with T-Shirts, bags, sombreros, and plaques, the real prized result for a top finish at this meet may be the automatic entry to Arcadia with a top 2 finish in the fastest heats of the 1600 and 800. The top two finishers in the 3200 fastest sections (girls and boys) will both automatically qualify for the Arcadia Invitational section. The top two Distance Medley Relay teams will also qualify for the Arcadia Invitational and their placement will be based on time. We should be able to witness many outstanding races throughout the day and it's amazing the type of effort you will see as novice and experienced runners battle to the wire in order to win one of those prizes mentioned above. The following is a closer look at all the sombrero races including the Distance Medley Relay.